What is the most important body of knowledge? That is a question someone could ask you on a job interview. I know because I have asked the question when I have interviewed candidates and I have been on the receiving end of the question as a job candidate. It may seem like a trick question but it does not have to be. Someone who asks you this question probably wants to know if YOU know the knowledge areas from the PMBOK ? Guide. This is actually a good thing because it means that person is expecting you to be a project manager and draw from the best practices that were created for all of us by the PMI ?. Before we talk about how you should answer this question let’s take a look at risk management versus communications management. When I teach project management and I’m talking about risk management with my class I tell them that project management is risk management. When I talk to them about communication management I tell them that project management is really focused around communications. Of course after I have told them both of these things I have to joke with them about being schizophrenic. I don’t think I am. (Would I know if I were?) The truth is I want everyone to consider walking around with a mindset of thinking ?What could happen?? When your team member tells you they’re going to finish an activity early don’t just thank them and move on, think ?What does that mean, what could happen because this piece of work is completed early?? If it’s on the critical path of course it means we have the potential to complete early. If it is not on the critical path you have the opportunity to take that resource and perhaps place them on a critical path activity or have them help someone else who’s having a difficult time. 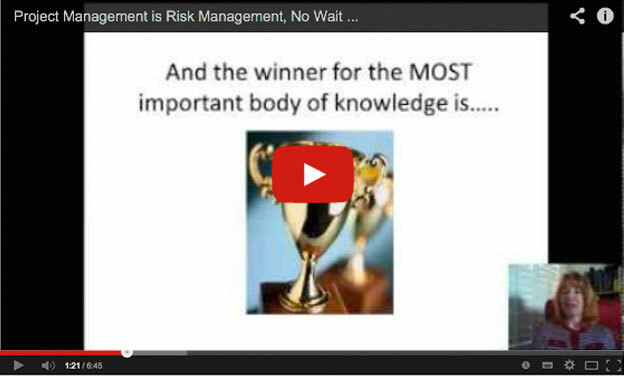 In that way you are practicing risk management because you are recognizing an opportunity. In the same way if a team member approaches you to tell you that it looks like some materials that have been ordered are going to be late you want to think to yourself ?What could happen because these materials are going to be late, what can be done about this?? I really am asking you to develop a proactive mindset. Another way that I say this is when you have a colleague who is managing projects and it looks like her projects always go very smoothly, you might be tempted to think that she always gets the easy projects to manage. That is probably not the case. Your colleague is probably very good at risk management and she walks around with a proactive mindset. She makes it look easy because she has identified and determined responses for many threats and opportunities that her project team will face. Now what does any of this have to do with communications management? What good is a completed risk register if nobody sees it? Not only do you want to walk around with a proactive mindset you also want to add to that phrase, so that the full sentence is, ?What could happen and who needs to know about it?? Let?s return to the interview. Your potential future employer looks across at you and asks you what is the most important Body of Knowledge? You can say all of them. But this person is really looking for you to make a decision. Go ahead and start out by saying that the PMBOK? Guide has many important processes and that all of them should be considered when running a project. Then you can narrow your focus and pick just one. If you could only use one Body of Knowledge on your project which one would it be and why? Make a strong case for your Body of Knowledge. Many times the interviewer has a preconceived notion as to what they want you to say. Often someone is looking for you to say either risk management or communications management. You can try to second-guess the interviewer and give the answer you think that they want. Or you can just do an excellent job with your answer. It’s best to just give your answer, that’s where you will be the most convincing and authentic. I still remember an interview where I was asked which Body of Knowledge I thought was the most important. I responded with communications management because I felt that so many projects suffered communication breakdowns. My interviewer listened to me carefully. When I finished he told me that he thought risk management was the most important and he told me why. We talked a little bit more and the interview ended. On the way home I told myself ?Well there’s one job I won’t be getting.? Guess what? I did get the job. I got the job because that particular manager needed someone to balance him out. He needed someone who came with more of a communications perspective, to balance out his more scientific risk-based approach. Now you see why it’s so important to just tell the truth. As much as you may want that job offer, you really don’t want to work someplace where you don’t fit in.